home › posts › The 5 Hardest Things About ... ten trees planted for every item purchased. Trees are what we here at tentree are all about. We plant 10 trees for each item purchased in our store! And it wouldn't be possible without our hard working tree planters. Recently, we wrote about how it is you get a tree planting job. Planting trees for a living is a rewarding experience, but we don't gloss over the fact that it's one of the most difficult jobs and definitely isn't for everyone. 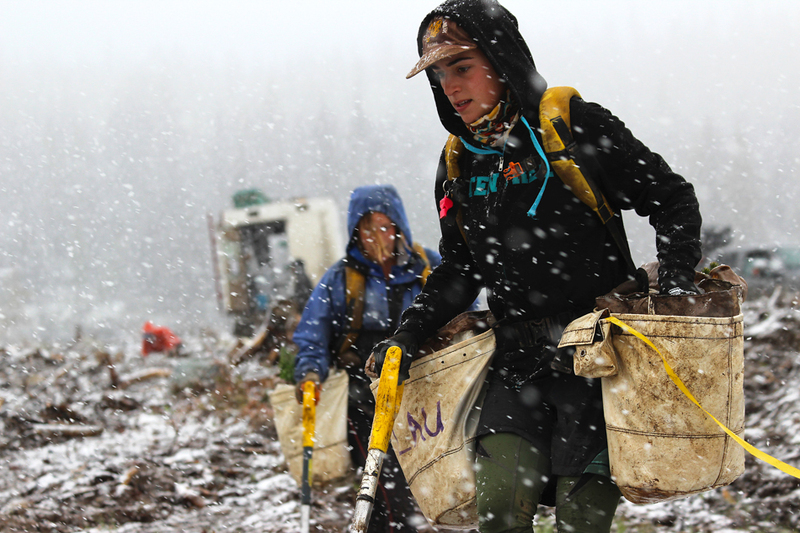 For a lot of people, tree planting can be one of the best summer jobs out there. It can be an incredibly rewarding experience, you meet some great people, and you have the potential to make a lot of money. At the same time however, it can be one hardest physical jobs you'll ever experience. It's a polarizing job that can have you cycling between love and hate on a daily, if not hourly basis. It's no secret that planting is hard work, but not only is one of the most difficult jobs, it is a physically demanding job for ten hours a day. What's more is that the better you want to be, the fewer and shorter breaks you'll take during those ten hours. Besides the long daily hours, you will only get one day off every three to five days depending on your company. Outside of the ten planting hours, your time is taken up by driving to and from the block, camp chores, making your lunch in the morning, and meals. If you're lucky you may get an hour or two of free time to do what you like before bed each day. Thinking a tree planting job isn't for you? Interested in jobs working with animals? Here's 5 wildlife-based careers that require no college degree. Make no mistake, planting is grunt work. It's been said that climbing Mt Everest is not so much a technical or athletic challenge, but rather an exercise in how much pain and discomfort you can endure over a long period of time. The same holds true for planting. No matter how athletic you may be in your outside life, planting will test your body in ways it has never been tested. Of course you need to carry your planting bags which can weigh up to 50lbs over rugged to terrain, climbing, ducking, and jumping over obstacles. You'll find soon enough however that the real challenge results from the repetitive motions inherent to planting. 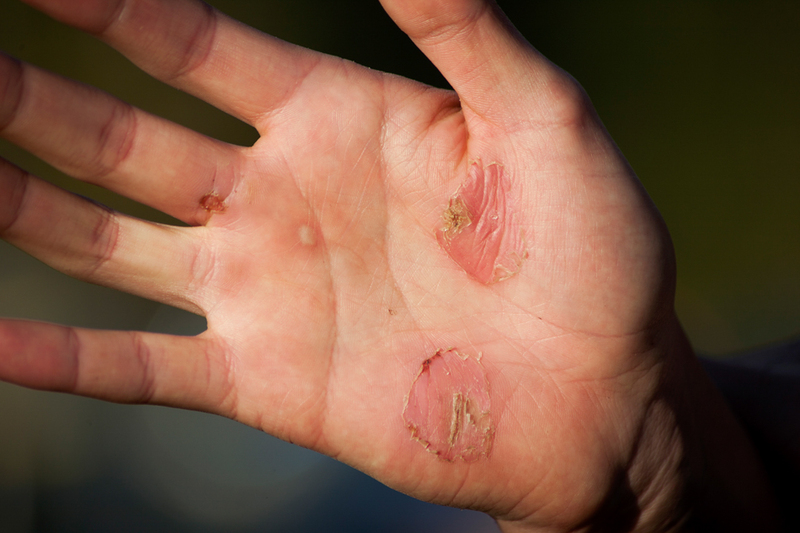 By midway through the season most planters have nagging joint related injuries, most commonly to the wrists or knees. Other physical nuisances include collecting cutes, scrapes, and bruises on a daily basis as you find your way through the slash, rolled ankles, and the tree planting classic, "Christmas Toe", numbness in your big toes so named because feeling usually doesn't return until Christmas. As with regular life, the weather has the ability to radically transform your mood on a day to day difference. The difference with planting however, is that the range is a lot more extreme. The great feeling you had over breakfast about the coming day can soar even higher when you get to the block and discover the sun is out, yet the wind keeps it cool and takes care of the bugs. Or, it can be crushed when during the first bag up the clouds begin to rumble and the skies open up. The same wind that mercifully kept the bugs at bay yesterday now chills you to the bone, leaving you no option but to plant faster in order to warm up. Many people who've spent most of their lives living in the city, can find it hard to adjust to the relatively spartan lifestyle accompanying tree planting. No cell service, limited or non-existent internet, a lack of in ground plumbing, being stuck out in the wilderness with a bunch of crazy bush folk... All these factors can make it really hard to find much joy in camp life, especially when all you want after a tough day on the block is to have a hot shower and veg out on the couch watching tv. Sorry, it's not happening out here. At the start of every season there is a near blissful period of serenity on the block. You might find yourself stopping, looking around and taking in the beauty of nature around you and think, "This isn't so bad. The sun is out, the landscape is breathtaking. Tree planting is going to be great this year." In a few short weeks however the mosquitoes and blackflies will have made there way to every corner of the block, camp, and your tent, leaving you cursing your decision to ever venture out into the bush in the first place. It's impossible to describe to someone who hasn't experienced the affect that the bugs can have on a person's psyche, especially during the first few weeks of bug season. The'll force you to cover every inch of your skin in long, tight knit, mosquito proof clothing, leaving you now battling both the heat and the bugs. No matter how thoroughly you cover your face they'll find ways into your ears, nose, mouth and eyes. It's not uncommon for planters to receive "bug face" a condition where after being bit to an extreme extent, your face swells up, often forcing eyes shut. One planter was bit so many times on the leg a few years back it swelled up and he was rushed to the hospital, almost needing the leg amputated. I can't overstate what a difference planting with and without bugs makes. 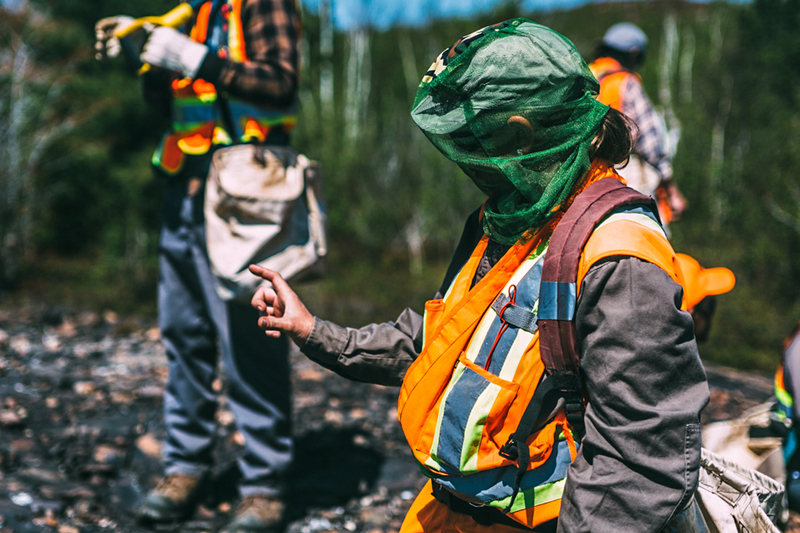 While you may typically think of mosquitos and blackflies as a minor annoyance, they will leave you cursing with every breath, and driving you to the brink of insanity on the block. 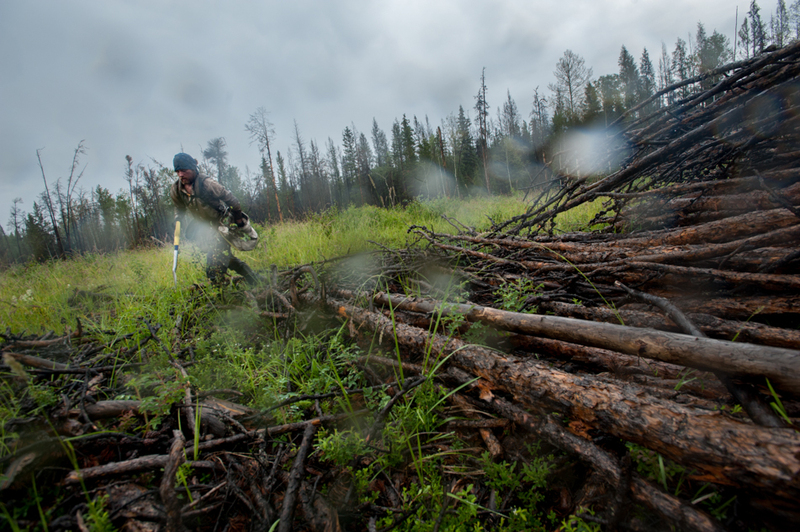 The post The 5 Hardest Things About Working A Tree Planting Job appeared first on tentree.